Specially outfitted Transit vans will go wherever Hoonigan does. As Ford's in-house gymkhana master, Ken Block gets some pretty sweet sets of wheels: Mustangs, Raptors, and rally machines of various vintages to play around with for his amusement and ours. The latest additions to his fleet aren't anywhere near as cool as any of those, but they're still hotter than most cars, trucks, and (suffice it to say) vans on the road or off it. The pair of Ford Transit vans were specially prepared by Blue Oval mega-dealer Galpin Auto Sports for Block's Hoonigan rally team to service and support whatever antics he's up to. The idea harkens back to the 1980s and '90s when rally teams would dispatch fleets of vans around the stages to service cars on the fly – back before central service centers were set up at each rally. But Ford Performance, Hoonigan, and Galpin have applied the formula to more modern, powerful, and capable vehicles. For starters, as you can see, they're all wrapped up in matte black for a rather more sinister look than you typical delivery van or shuttle bus. The only splash of color is the stripe pattern of blues and purples (and the smattering of decals). 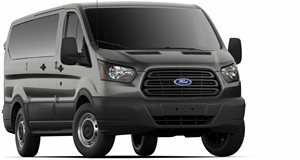 They're also fitted with all-wheel drive, all-terrain tires, and brush guards to take the vans off-road to wherever Block and his team might need to position them during events. Roof racks can carry extra equipment, and auxiliary lighting illuminates the sight to keep working after the sun goes down. Inside it's all business, with service benches and storage for all the gear the team could need to keep Block's main ride up and running. There's even an electric tea kettle to keep the Brits on the team supplied with hot caffeine on what's sure to be a fun but demanding job.